The implementation of EHR Systems has changed the way healthcare facilities and practitioners communicate among each other and with clients. As these processes continuously evolve, there are many factors to consider. While the transition to EHR & EMR systems has increased, so has the need for flexibility and efficiency among practitioners, doctors’ offices and medical facilities. This has introduced the move from client-server based EMR systems to cloud or web based EMR systems. These costs are significantly eliminated, as the need for on-site servers is completely eliminated. From a business standpoint, doctors’ offices and some practitioners may want a server onsite as a backup method, using the cloud-based system as the primary. Implementation of web-based systems speeds up the process and allows practitioners and facilities to transition at a faster pace, even with customization. The monthly costs also include software upgrades and maintenance, resulting in cost savings in a number of areas. To learn more, read How Much Does an EMR or EHR really Cost? You never have to worry about software maintenance and upgrades. All upgrades are managed server-side by your web based EHR vendor. Your data is protected against hardware and software failures through the use of fault-tolerant hardware and sophisticated, redundant data backups. Implementing these features in your own facility would be prohibitively expensive. Using web-based systems adds an additional layer of protection against any inclement weather or incidents that may occur at the facility that would prevent access and retrieval of the records. This also eliminates privacy-based issues associated with having paper-based files. Most EMR hosting companies have multiple layers of security measures in place to protect data and remain in compliance with HIPAA regulations, and provide high levels of support that are not normally possible for small clinics or solo practitioners. While as many as half of patients are skeptical about the security of their data, older legacy systems are actually less secure than newer EHR systems. Frequently updated EHR technology protects against data breaches and new emerging security threats. Additionally, cloud based EMR systems offer enhanced data security as well as data backups, so both you and your patients can feel secure. Additionally, EMR and EHR systems allow patients to utilize patient portals. Patients are able to review their own electronic health records, lab results, and messages. The portal can also be used for appointment reminders, check up reminders, procedure dates, billing statements, and lab results. This not only provides a better experience for the patient, but frees up valuable time for the provider and their staff. Patients are able to retrieve their records and view any changes to their records without having to request their medical charts from the doctor’s office. This also allows physicians to leave notes for their patients in the record at any time, keeping the lines of communication open. 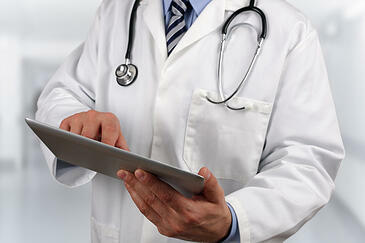 Web-based EMR & EHR systems are suitable for practices of any size. Gone are the days that web based or cloud based EMR is preferred by only small practices. Even mid-sized and some larger practices are opting to implement web based versions of EHRs. When you implement web-based systems, integrating additional locations or physicians onto the network is simple, expanding opportunities for growth and provides scalability without any additional investment. As the healthcare environment continues to evolve, transitioning to a virtual environment is not only useful, but makes smart business sense in affordability, hardware and maintenance costs. An efficient and cost-effective way to use the most technologically advanced systems, web-based EMR & EHR platforms continue to dominate the future. Ready to make the switch? Learn more about our Web-Based EMR Software or schedule a free EMR demo.